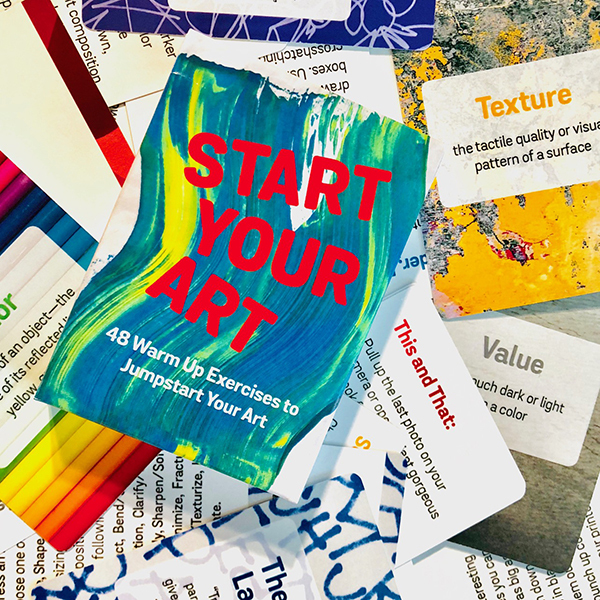 Hot off the press, Lyric Kinard’s Start Your Art deck of cards / prompts is available as an actual deck or a digital download. You can get the deck here at Lyric’s shop. 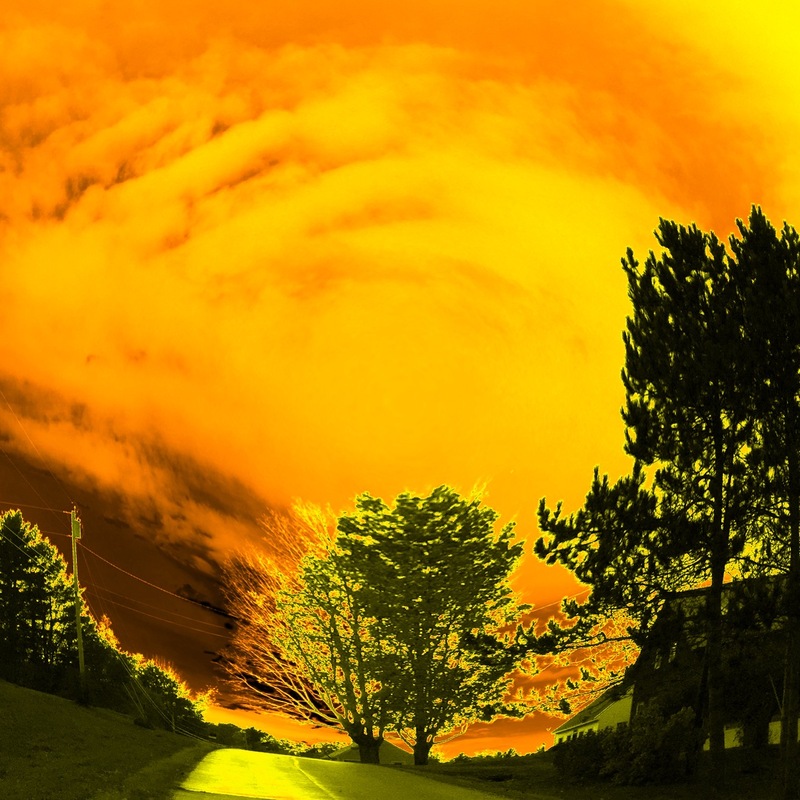 Then, not long ago, Laurie Russman, of neonkittyquilts on instagram and website, told me about the MegaPhoto app she uses to make “tweaked” photos. Sitting waiting for my annual physical check-up, I decided to play–a prompt from Lyric’s deck plus MegaPhoto! Lyric has some suggestions–like set a timer and keep it short–to get you started along with 48 exercises. I hopped around the set randomly and selected one (and of course I forgot to write which prompt) that I could do on my phone while waiting. I began with a frequently photographed location on my afternoon dog walks and used one of the MegaPhoto filters to get this image…all sorts of new ideas for quilts are funning (what a hoot, that was meant to be running, but I like the typo!) 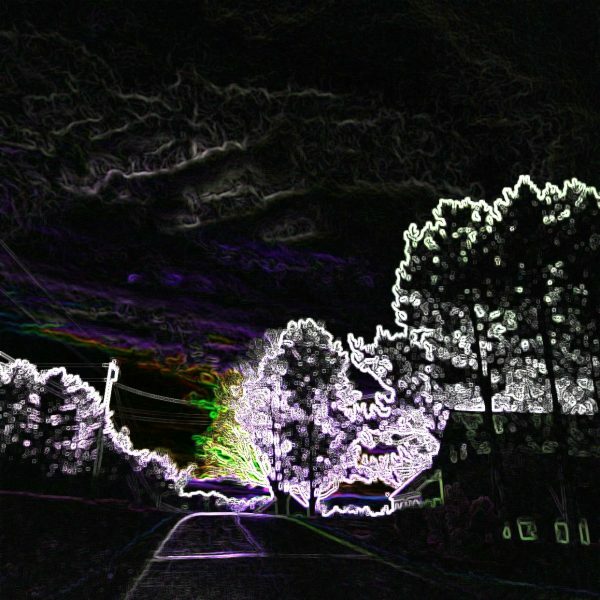 through my head. To those of us who have been teaching ourselves art for a while, some of the prompts may be familiar, some are new, but I have to say I totally love having these on my phone where I can take advantage of those moments where you are somewhere without a book–a productive alternative to Facebook! Even familiar prompts become new and are worth doing again. Then I tried another filter on the same photo–what a difference in mood! 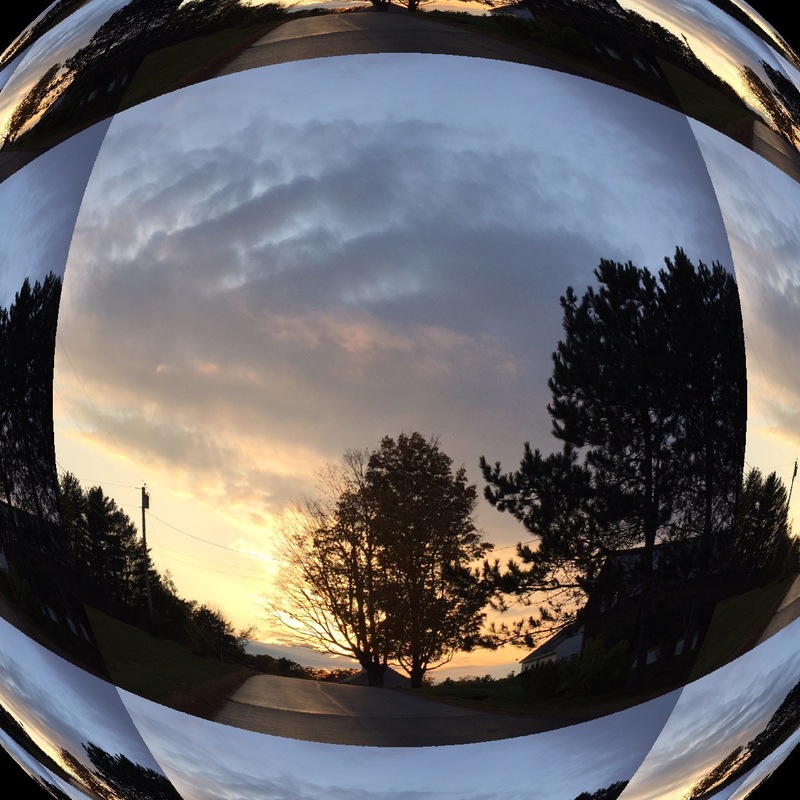 Another filter in MegaPhoto –just look it up in your App Store. I believe there is a free version, but you can get rid of the ads and add a few extras for about $2.99. Love the prismatic, fish-eye look to this photo. 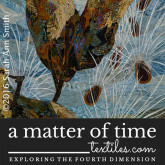 I can see playing around with this type of composition and fracturing in an art quilt….maybe over winter? Or even…hmmm…printed onto cloth, then paint on the cloth, then quilt….hmmm…. See, that’s what happens with prompts: they get the creative juices going. They let you get out of your own way and try something that isn’t in your “usual wheel-house aka creative safe spot.” I’ll do a proper review of the deck in mid-November when it’s my turn, but just wanted to let you know what I’m doing now that the boxes of stuff are shipped to Houston, it’s not yet time to pack clothes, and I’m noodling around with play time! Hi all! Popping in for a quick post: An interview with yours truly about my work and my submission for this year, Pink Oyster Mushrooms, is now live on the Dinner@8 blog, here. International Quilt Festival Houston is approaching, which means for the 10th year there will be a Dinner@8 exhibit, a juried invitational, which has showcased some of the best art quilts being made in the past decade. 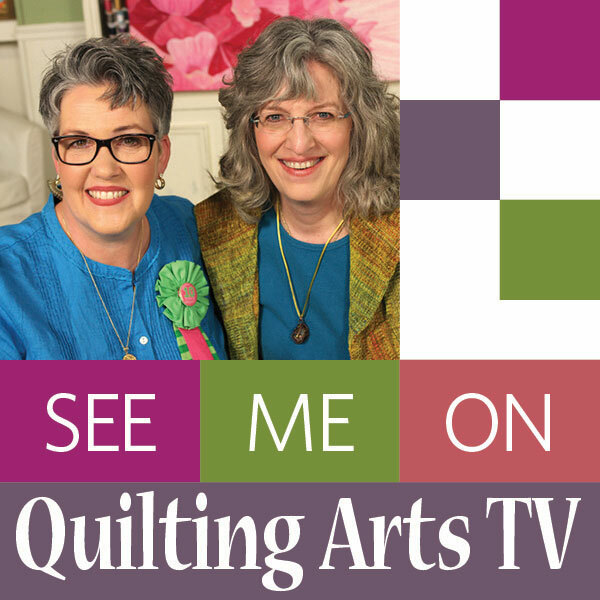 I have been fortunate to be invited to participate for 9 of those years and was accepted in all but one (and I totally agree with the curators…I would have picked other quilts than mine, too!). I am THRILLED to be in what is the final exhibit because, sadly, all good things come to an end. From the quilts I have seen, this may be the best exhibit yet. Conceived and curated by Jamie Fingal and Leslie Tucker Jenison (click on their names for link to their personal websites), each year they selected a theme and a size for the exhibit. The size was in place for three years, then the next three years a different size, etc. This last year, the size was 30×50, and we were asked to choose one of the themes from the past nine years. Honestly, my quilt could fit under many of the themes. The way it works is in November (or thereabouts), Jamie and Leslie sent out a theme to a group of invited artists. You them made a quilt, only one, to fit the theme and size and submitted it by the due date. Then you waited to see if you made it in to the exhibit. I am beyond honored to have had my works next to so many spectacular works—truly, go browse the exhibits for each year and even go buy the catalogs (links on the Dinner@8 site). THANK YOU Jamie and Leslie: you have created through these exhibits a body of the best of the best, and I am beyond gobsmacked that I have been able to be a part of these exhibits. To see all the interviews this year and those from past years, click on the Dinner@8 Blog link. So as the frenetic 2017 winds down to a close, I thought I’d share some photographic inspiration from a recent dog walkies. I’ve been largely absent from my blog, mostly because I’ve (a) been too busy and (b) been posting on Facebook, which is faster and easier than the blog. But I figured I need to do at least a little bit of blogging. Maybe I’ll ease in with a post a month, and see if I can get it up to two a month by spring? Anyway, please enjoy the beauty of my world! Let’s start with one of the most seasonal images. I love the shallow depth of focus. 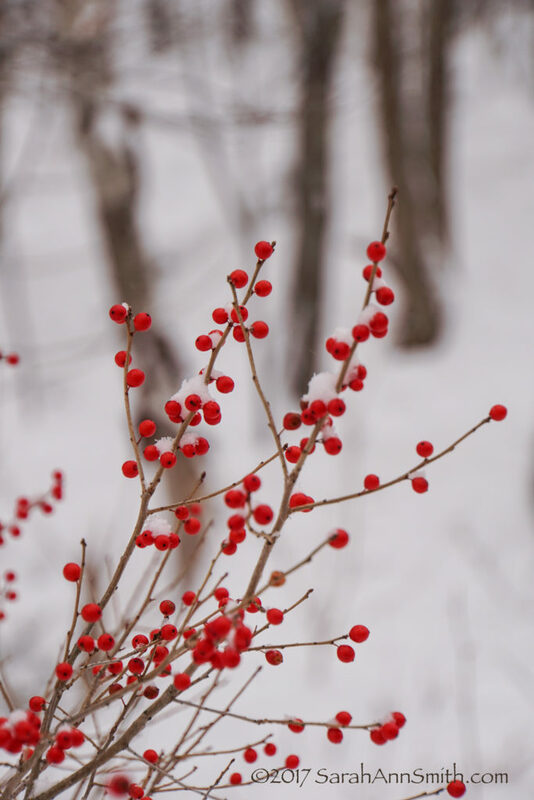 For non-photographers, that means adjusting the aperture, how far the lens opens, so that the berries are sharp and the woods are not. 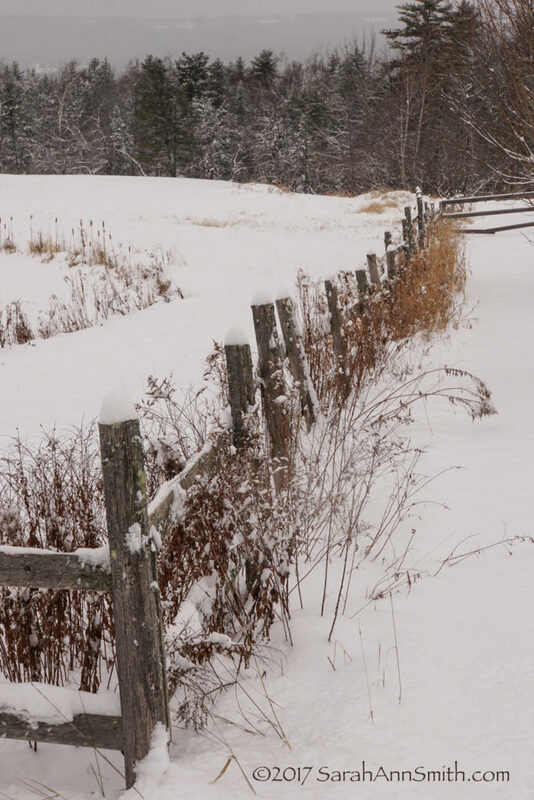 A fence near the pond where I take sunset pictures during warmer times of the year. Sunset is now about 4 pm, so I don’t get over there at that time of day. Selected for my photo challenge–this week’s theme was round. Mother Nature’s ornaments! Round is more than a circle or a ball. 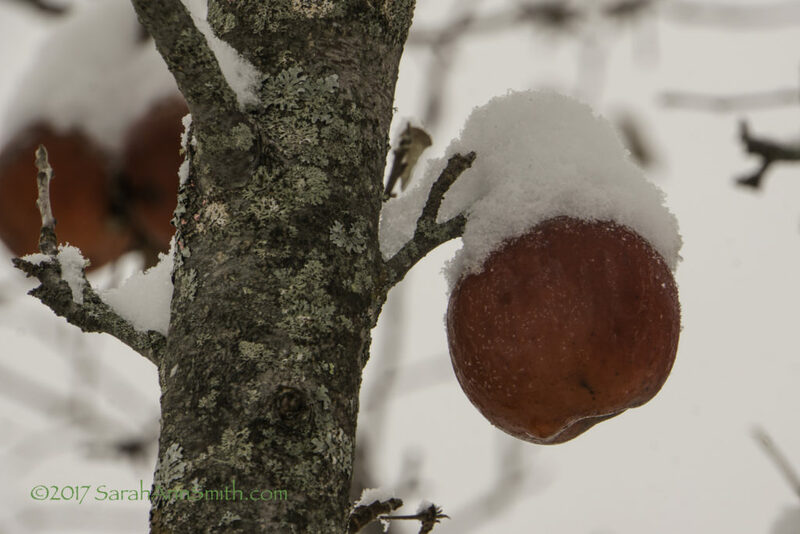 The apples, the tree trunk, the seasons going ‘round…. not to mention my obsession with lichen spreading out. Minor adjustments to clarity, shadows and red hue saturation to get it to look like the eye sees it. 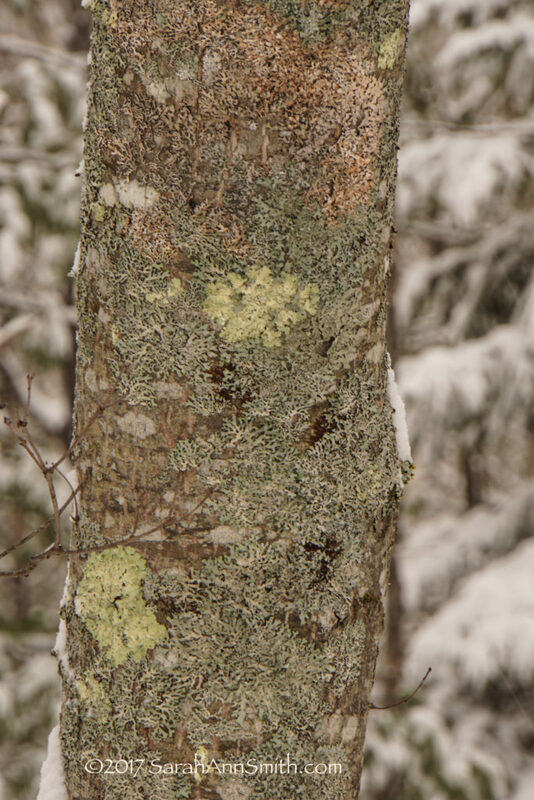 My obsession with lichens continues… look at these subtle colors and textures and intricate shapes! 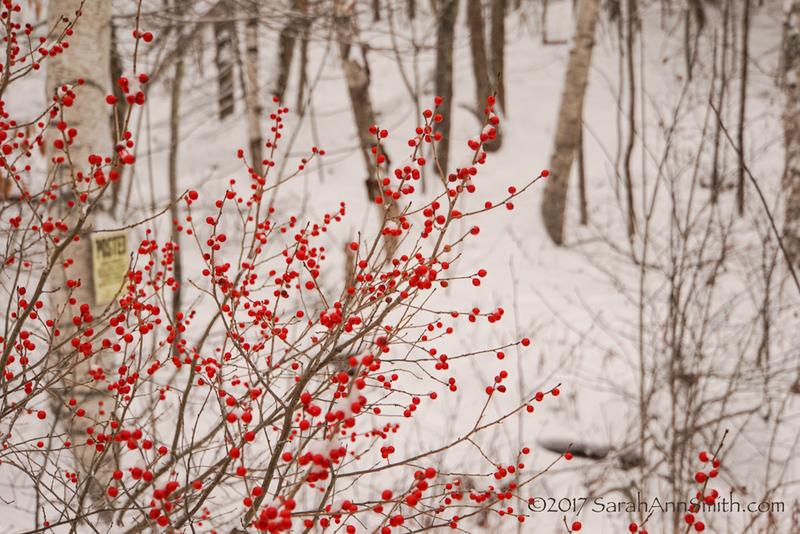 Another view of the berries. This run-off creek(shrouded in snow, trust me, there’s a creek under there) is at the back of our property if you were to walk up it a quarter mile or so into the woods. There it is flat and almost not there, but it picks up water from the two folds of the hill that border it on the way down to the road. 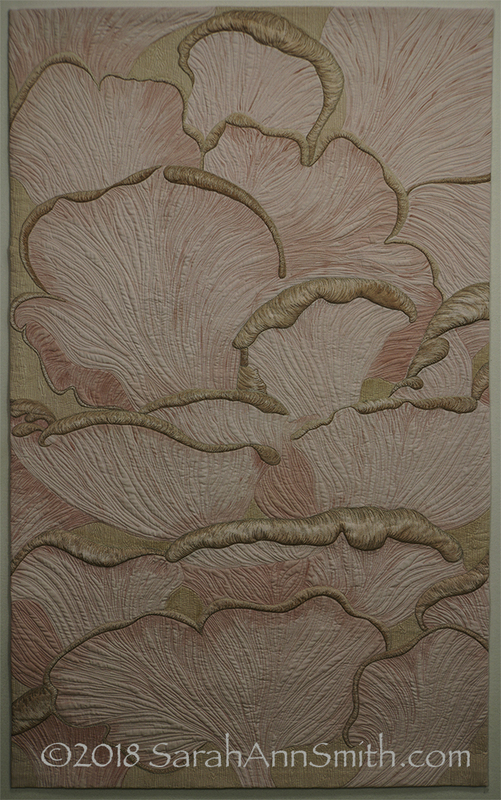 My friend Jenny Lyon loves grasses and has made some stunning art quilts of them. I think I’ve been channeling Jenny a bit, especially with the next photo. My friend Jacquie has teased me that I am doing a series of art quilts on weeds. 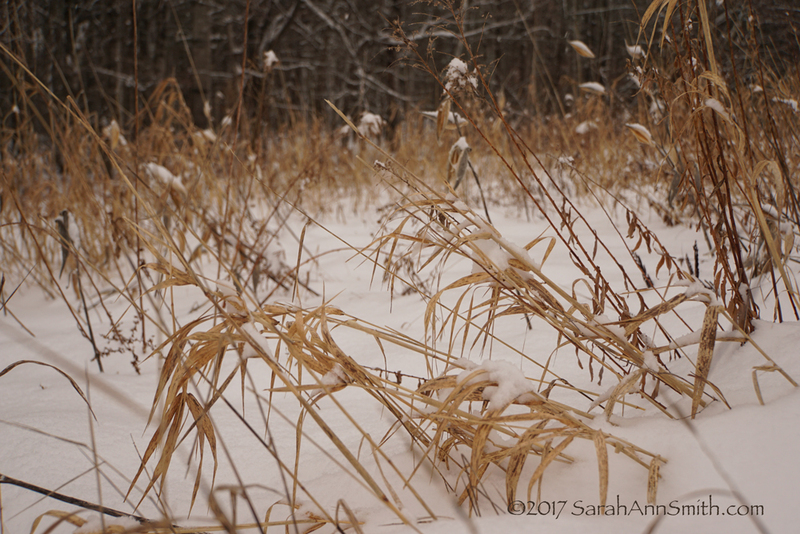 She’s right–I love the wild bits of nature that creep into my world. This photo is the one that most makes me think of Jenny’s work and her beautiful California garden (seen only in photos as we live about 2800 miles apart). This clump was transplanted when we built the garage because it was where they needed to trench for electricity. It has limped along since 2012, but finally this year is showing signs of perking up. Plus, just this year I finally learned what it is called (and it is written SOMEwhere…hope I can find it), so I plant to put in more. 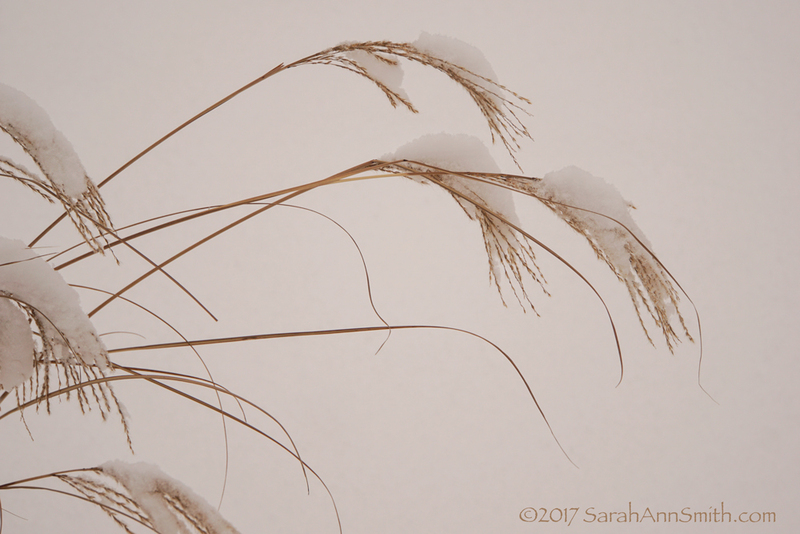 The fluffy tops cast the most glorious shadows on the snow when it is next to the porch and lit up at night. Not the most riveting shot, but it is the beauty of my world as I see it from the house–at this angle I’d be in the kitchen at the sink though this was taken outside as immense snowflakes began to drift down. 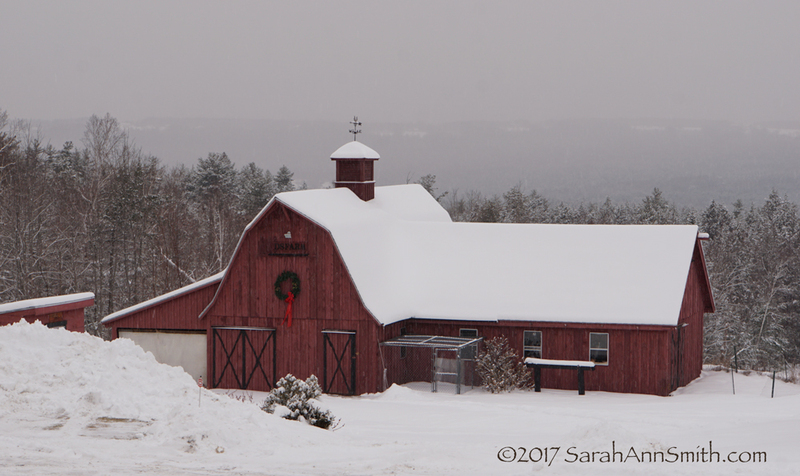 And another scenic shot of a barn down on the street, about a half mile walking, perhaps 2/10 as the crow flies over the woods and neighbor’s lots. 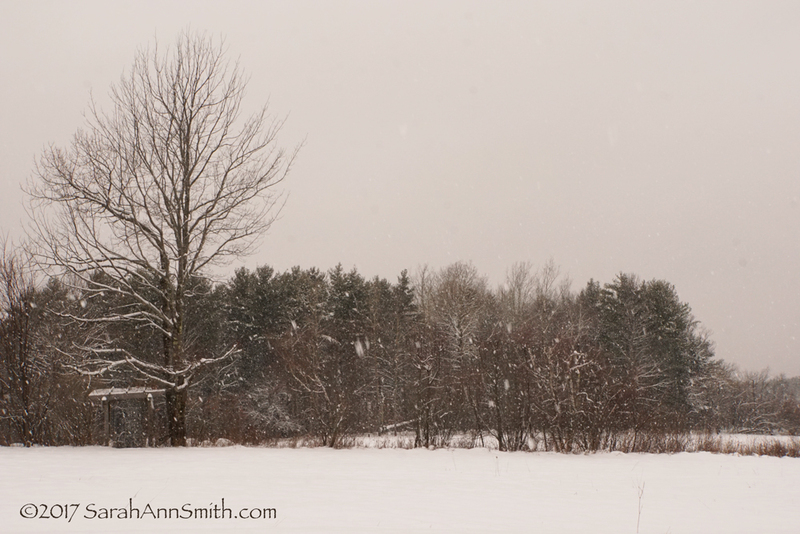 Appleton Ridge is in the distance, barely visible as the snow moves in. Enjoy the season. Tomorrow is Solstice, when the sun begins to return and the days lengthen. We will light candles to celebrate the return and look forward to a family weekend together! Eleven Years of blogging and some letters…. According to my calendar, today is my 11th Blogoversary. Yes, I have more or, most recently, less been blogging for eleven years! To mark the occasion, I’m sharing a photo from this week’s Photo Challenge (a follow on to the class I did with Ricky Tims last year). Instead of doing my initials, I chose to do Eli’s since he will be leaving for college (SOB) shortly. I’ll thrill you all I’m sure with dorm move-in pics, and will do my darnedest not to start crying until after we leave campus. The photo challenge theme for this week is Found Alphabet. 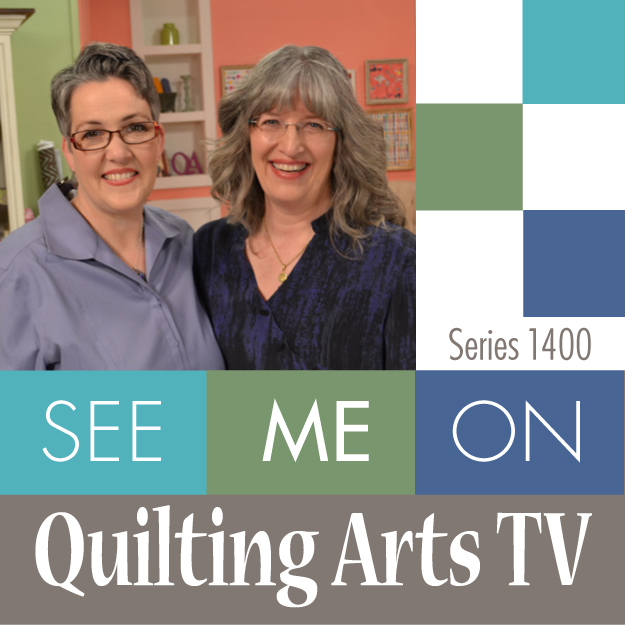 I actually teach a Quilting Design class which uses this “learning to see” exercise (Info is here, scroll down to Quilting Design). Since our son leaves for college soon and I’m busy, I almost skipped this week; . But I decided to give it a quick go using only the grout lines from our stone fireplace; I also opted to do Eli’s initials: WEKS. The W is a mirror image of the center stone (I’ll post the full fireplace in my Flickr album), cropped, and squeezed in from the sides. The E is flipped horizontally, the S flipped vertically, and the K is a shot taken on the diagonal. 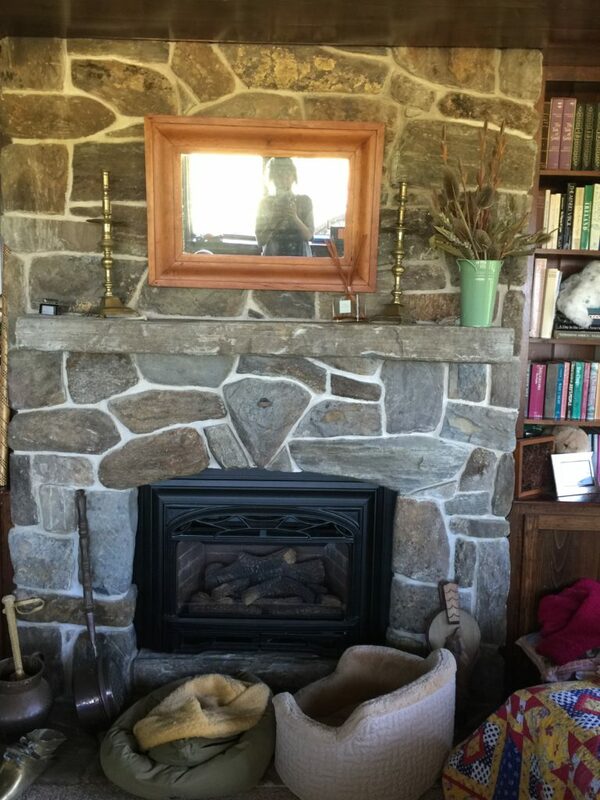 Here is a photo of the fireplace, source of the letters. All the letters were “found” in our fireplace. It’s gonna be hard being an empty nester. Our lives have revolved around Eli’s sports for so long, every week a meet. This year, none. I know I will have more than enough to fill the hole, but still. Spent the morning copying his iPod playlists so I can play them when I am feeling homesick for him. Maybe I’ll even spend some of that time blogging…what a concept!